At the Vision 2014 SVS-VISTEK showcased a new versatile camera series in a “classic“ 50x50 design. The EXO allows system integrators to easily adapt a solution to varying conditions and requirements. Ease of integration scalability, without sacrificing functionality, was the design objective of the EXO. The precision-machined monocoque style aluminium body houses a complete offering of sensor and interface combinations. 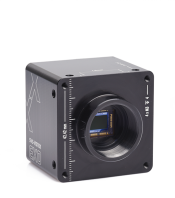 You have a wide choice of current CMOS and CCD sensors, such as the recently released Sony IMX174 CMOS (2.3MP), offering up to 73dB dynamic range, or high-end CCDs ICX674 (3MP), ICX694 (6MP), ICX814 (9MP) and ICX834 (12MP) and the CMOSIS CV4000 (4MP). The ON Semi Python CMOS series, ranging from 0.3 to 5 MP and well established ON Semi KAIxx050 series, providing resolution up to 8MP, will be become available in Q1/2015. This will make the EXO the true successor of our CF series, giving you the perfect camera for a wide range of vision solutions. For the efficient transmission of images, a wide range of flexible interfaces are ready to take on any task! Choose between GigE Vision, Camera Link Base or USB3 Vision standards. All SVCam-EXO models have the same broad set of features. The most outstanding is a truly powerful feature that allows up to 4 LED illumination sources to be individually driven and controlled. The integrated sequencer lets you program multiple exposures with varied settings, creating new and cost effective possibilities for your applications. In conclusion - Precision cameras at a reasonable price tag. Bringing together a wide range of the latest CCD and CMOS sensors in uniform housing concept. Easy to integrate, thanks to the use of standardized connectors and pin-outs across all series. Backed up by industry standard digital video interfaces.